A 28-year-old US man faces up to 10 years in prison after pleading guilty to carrying out a cyber-attack on global intelligence firm Stratfor. "Anarchist and hacker" Jeremy Hammond - who said he was part of activist group Anonymous - was charged with stealing information from Stratfor in 2011. The data included details of more than 850,000 clients, including government and law enforcement agencies. 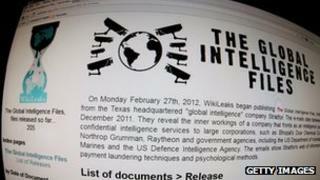 Some of the accessed material was subsequently published by Wikileaks. Credit cards linked to some of the accessed details were used to spend more than $700,000 (£465,000) - with some of the money going to charities including the Red Cross and Save the Children. His supporters have called Hammond "one of the few true electronic Robin Hoods". Wikileaks' Julian Assange released a statement after the guilty plea saying: "The Obama administration's treatment of Jeremy Hammond is a disgrace." Hammond, who operated under pseudonyms such as "crediblethreat" and "yohoho", was arrested last year after US authorities were helped by Hector Monsegur - a hacker-turned-informant known online as Sabu. Hammond told a judge in Manhattan: "As part of each of these hacks, I took and disseminated confidential information stored on computer systems websites used by each of the entities." He is expected to be sentenced on 6 September. His brother, Jason Hammond, told the media that Jeremy should not face a "harsh sentence" for an "act of protest from which he did not personally benefit".